On Thursday, May 5th, five teams of emerging leaders presented rapid-fire project pitches at the 3rd annual ELNshowcase – a Dragon’s Den-style event to support the incubation of new and unique city-building ideas. Congratulations to Get Outside! 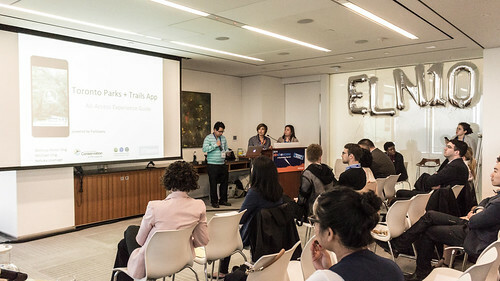 Toronto Parks + Trails App which took home the grand prize package of $1500, 100 hours of co-working space at the Centre for Social Innovation (CSI), a strategy session with PwC and promotional support from NOW Magazine. Congratulations to Tkaranto Project and New Understandings (NU) who tied for second place, and to the Baby Bucks project which took home the inaugural People’s Choice Award as voted on by attendees in the room. Learn more about the project idea! You can also watch a Periscope video from the evening on the ELN twitter page!